When we talk about Rajasthani food first thing which comes in our mind is Dal-Baati-Churma. It is a complete meal in itself as it is highly nutritious, filling and includes all tastes in it. All Rajasthani festivals and wedding are incomplete without this famous trio combination. Here comes the recipe to make this popular dish Daal-Baati-Churma. Cooking Oil / Ghee - 3 tbsp. Chana Daal - 2 tbsp. Whole Moong - 2 tbsp. Urad Daal - 2 tbsp. In a large mixing bowl mix together wheat flour, semolina, besan and salt. Add ghee/oil and using milk prepared a tight firm dough. The dough should be tight and firm unlike normal chapatti dough. divide the dough in a lemon sized (golf ball) ball equally. Flatten the ball and shape into like a tikki and make a thumb print in middle of each baati. Boil enough water in broad deep vessel and drop all baaties into boiling water. Water should be enough to cover all baaties. Cook it for 15-20 minutes on high flame. Preheat oven on 200C and prepare baking tray with parchment paper. Drain out baati from water and arrange in baking tray. Bake baati on Broil mode for 15-20 minutes or until they turn golden brown. Baaties are ready to serve. Check notes below to see alternate ways of cooking baati. Let baaties cool down completely. For authentic churma baaties are specially fried into ghee. I prefer non fried baked version for health reason. Roughly break them into pieces and add into grinder. Add sugar and mixed nut into grinder along with baati. Grind them into fine powder and take out in serving bowl. Sprinkle carmom powder and slivered almonds on it. Pour melted hot ghee on it before serving. You can also make laddo by adding more ghee. Mix all 5 daals together in bowl and wash properly. Soak in water for 15-20 minutes. Boil them or pressure cook them until cooked properly. Roughly mash dal and add all spices : chili powder, turmeric, salt, coriander powder, amchoor in it. Add water if consistency is too thick. simmer for 5-7 minutes. For tempering - heat the ghee in a pan, add cumin seeds, clove, bay leaf n dry chili. Saute for a while. Once cumin seeds crackle, add ginger garlic green chili paste, asafoetida and garam masala. Saute again for a minute or 2. Add this tempering into daal. Dal is ready to serve. There are many ways to cook Baati. Its always preferred to serve hot hot baaties with ghee. They are little crisp outside and soft inside. Sometimes they also used only boiled baati which is called buflo. It can also be made with different stuffing inside. Baatis can be stored as long as one week in refrigerator. 1. As mentioned above you can bake them in oven in Broil mode after boiling. 2. You can deep fry them in low flame directly without boiling. 3. You can use gas tandoor to cook them on grill. If they are boiled it will take lesser time but you can cook directly too on medium to low flame. Dal should be spicy and tangy. Adjust chili powder as per your spicy level. Add tamarind pulp or lemon juice to make it more tangy. Paneer Fried Rice recipe which I adapted the style from the fundamental Veg Fried Rice . Paneer is crumbled and mixed with a stir fry of garlic, chilli , array of vegetables and sauteed with rice. Season with salt and pepper for taste. Garnish with spring onions offcourse. I have always loved fried rice, so I could probably finish an entire bowl. The great thing about this recipe is that can add whetever other ingredients you would like! An easy and delicious fried rice recipe that will go perfect to any spicy gravy when paired. First defrost / thaw the paneer if using frozen one. Add the paneer cubes to the hot water for 5 minutes. Drain the paneer and crumble it. If you are using fresh homemade paneer skip this step. Check the homemade paneer recipe here. Measure one cup of basmati long grain rice. Rinse thoroughly in the running tap water. Soak in 2 cups of water for 15-20 minutes. Pressure cook it for 3 sounds. Once pressure released, transfer the rice in a tray to cool completely. Chop the vegetables into small chunks or as desired. Meanwhile heat a fry pan with oil, once oil turns hot throw in the chopped garlic, green chilli and saute till turns golden and aroma is felt. Add the chopped, spring onion(white), carrot and beans, saute well and sprinkle some salt to cook faster. Now add the crumbled paneer, stir to combine well with vegetables. Crumble more, if you wish. Add the rice and mix well again. Care not to break the rice grains with excess stirring. Season with salt and pepper. Combine to work, garnish with spring onions. Serve the fried rice with spicy gravy. I served with Mushroom Masala. It was delicioco. You can use the leftover rice to make this fried rice, if you wish. I didn't use any of the soy sauce or vinegar to add flavors, if you want go head. Increase the chillies if you are spicy lover, anyways it's upto individuals taste preference. 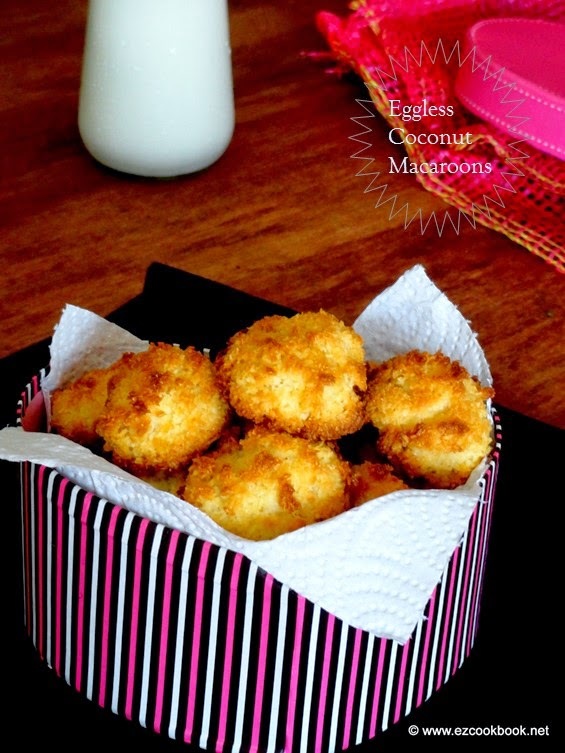 Crunchy on the outside, chewy in the middle, a good coconut macaroon is irresistible indeed. Just imagine you can make macaroons with just two ingredients - coconut and condensed milk. Coconut macroon is my childhood favourite which is also called as thengai biscuit that is popularly available in Iyengar bakery in my home town. These are light and fluffy, naturally sweetened macaroons. Apart from normal cookies or biscuits this sounds to be simple with minimal ingredients. There are countless ways that you can tweak this basic macaroon recipe for your own tastes and notion. But this is the best ever recipe I would like to bake every time for quick treat. * check here for homemade condensed milk recipe here. Preheat oven to 350F, and line a baking tray with parchment paper. Combine all of the ingredients in a medium bowl, and mix until well combined. Drop the batter by rounded tablespoons onto the lined baking sheet, and tap gently to drop evenly with the help of spoon or your finger. Maintain 1inch distance apart between macroons. Bake for 20 minutes at 350F, or until the cookies are lightly golden on top and dark golden at the bottom. Leave the macaroons in the sheet for 5- 10 minutes, then use a spatula to gently remove the macaroons from the baking sheet, and allow to cool completely on a wire rack . Once cooled completely it will become harden, store it in air-tight container, keeps good for upto a week and enjoy. You can dip the macaroons in melted dark chocolate, if you like. Simply place the dipped macaroons on a dish lined with parchment paper, and allow the melted chocolate to set in the fridge until firm. You can use tutti-fruitti along with the coconut in batter, if you like. The cooking time for macaroon may vary depends upon the size (longer time for big macroon and shorter for macroon). 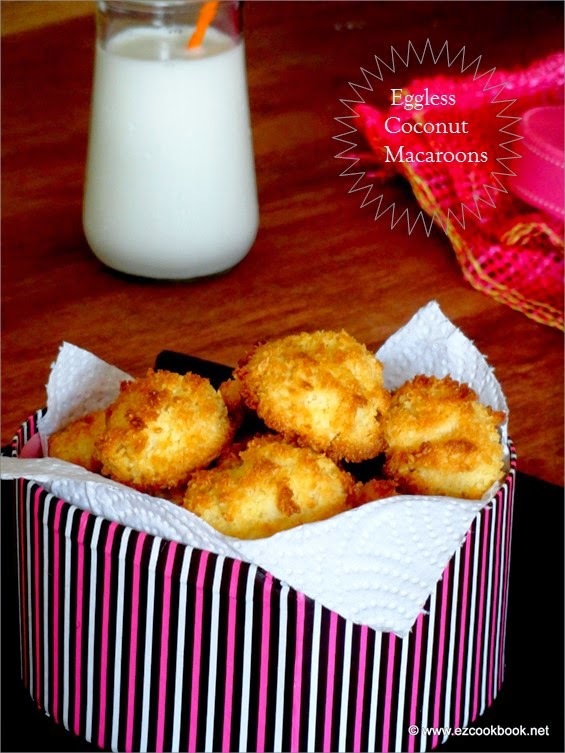 To make more crispier or lighter macaroon add more coconut. Rememeber macaroons may look soft while hot, don't bake again, but once cool it will become harden. Brown rice dosa, is an alternative to the regular dosa. It tastes equally good like regular dosa. Serve with sambar and chutney. We all are talking about healthy living and always looking forward for recipes as such, but before making any alternatives think of are we eating food in a right way? Information about Brown Rice(source from wikipedia) Both brown rice and white rice have same amount of calories and carbohydrates. But the difference between two rice lies in the form of processing and nutritional value. When only the outerlayer (husk) of the rice is removed Brown rice is produced. When further processed and milled, polished it becomes white rice. Due to this process most of the vitamins, minerals and other source of nutritients is lost. Now what you can do is replace your white rice with brown rice as much as possible for making dosa, idli, adai, paniyaram. Slowly replace cooked white rice to brown rice. Rinse the brown rice thoroughly in the running tap water for atleast thrice. Soak it in fresh water for 3-4 hours. Similarly wash the urad daal in water and soak for 2-3 hours. Add fenugreek while soaking itself. Grind urad daal to smooth and fluffy batter. Same way grind the rice to smooth batter, adding water as needed. Combine the ground batter together in a large vessel , add needed salt and mix well. The batter consistency should be such that it thicky coats if a spoon is dipped in it. Cover the vessel with a lid and keep it in a warm, dark place to ferment for minimum 8-10 hours. After fermentation, laddle the raised batter and stir well. Now the batter is ready to make dosa. Heat dosa tava or pan, drizzle little oil if needed before making first dosa. Pour a laddle of batter onto the center. Gently begin to spread the batter in sweeping circular motions to form a 8" dosa. Slowly dosa develops tiny holes as it starts cooking, drizzle oil all over the surface and edges of the dosa. Once the upper surface seems to be cooked, flip the dosa to the other side for a minute. Turn and fold it in half, dish out. If you want the dosa to be crispy, do not flip the other side. Serve the dosa with sambar and chutney. as per your choice. I have served with Tomato Chutney. Poha or Flatten Rice (preferably red poha) can be used to make dosa. In such case, use 1/4 portion of urad daal and 1/4 portion poha. Follow the same way to make brown rice Idly, remember to grind the rice a bit grainy. Avacado almond milkshake is extremely delicious and perfect breakfast drink. These are widely used in sandwiches, wraps and salads due to its high fat content. It is used to make a popular mexican dip , guacamole. More over it's a best skin food that nourishes and makes skin glow. It is rich in antioxidants, maintains heart health, improves metabolism. Avacado has 200 calories per 100 grams. Due to high in calories(healthy source) it is good for people who wants to gain or manage weight. Mix avocado, milk, almonds, Ice water and sugar in a blender until smooth and creamy. If you want the milkshake thicker or thinner, add more milk and ice as needed. Pour into glasses and serve it. Delicious breakfast milkshake is ready to enjoy !!! To add more flavours include choco or coffee powder to make delicious chcocolate avacado milkshake. Add other energy boosting fruits like banana, apple to improve metabolism. Couple of weeks back, my husband demanded for a healthy snack to keep in the office table to munch as much as he want without any guilt. He regularly use to have museli for breakfast, so what I thought I can make use of the leftover museli mix to make some energising bars. I have tried long before store-bought energy bars. It was chewy, tasty and filling yet costly too. When I googled up, I came across many recipes using museli. 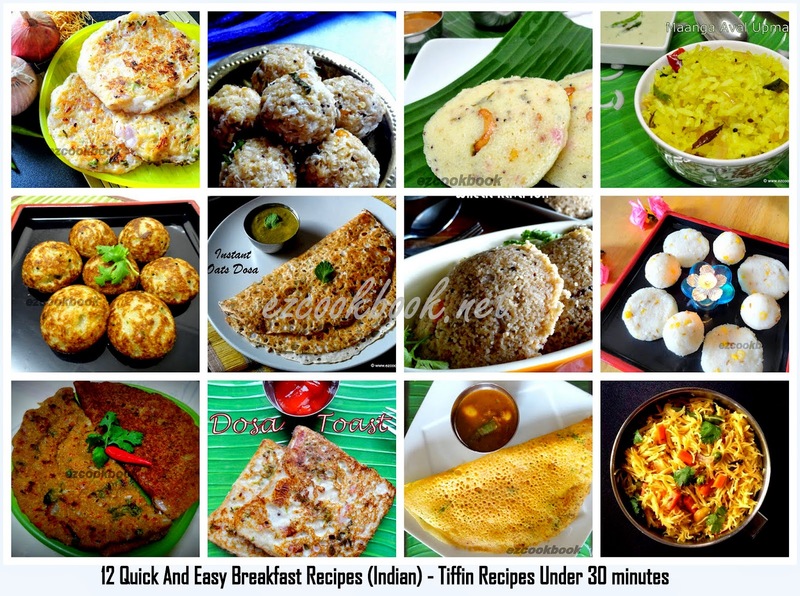 After so many hunts, I decided to give a try on my own with reference to few recipes which I browsed. My efforts was fruitful and it tasted absolutely delicious. Yep, my husband too liked it. Making your own homemade museli mix is quite easy and affordable. It's a popular breakfast recipe with the combination of rolled oats and other grains, some dried fruits and nuts or seeds of your choice. The ingredients given above is just for the basic idea, you can choose it as you desire. Combine all the ingredients and store it in a air-tight container. It stays for 2-3 months. To enjoy delicious breakfast - add the 1/2 cup of museli with a cup of milk and fresh fruits. These energy bites makes an healthy alternative for junks. Keeps you filling and energetic the whole day. The recipe is so simple and requires "no bake" further, just combine and set it. Enjoy !!! In a large mixing bowl combine the museli mix, coconut, broken dark chocolate pieces, pumpkin seeds. Melt the butter in the sauce pan, now fold in the nutella, honey and chocolate over medium heat. Whisk until smooth consistency achieved. Remove the sauce pan from fire and pour over the museli mixture. Stir completely to coat the museli mixture. The chocolate pieces should start to melt at this point. Now start shaping the mixture as you desire. Either you can shape it as a bars or bite size balls. I like to make small bite size balls and did so. Arrange in the greased tray or tin and refrigerate overnight or minimum an hour before use. If you desire to make bars, place a foil in the tin and pour the mixture to the tin. Pat it using a flat spatula to set. Refrigerate and once firm, invert the foil and cut into bars of desired thickness. Top it up with coconut flakes, if desired. Enjoy the guilt-free, chewy, munchy energy bites. Substitute your favourite nut-butter like almondbutter, peanut butter for nutella. Also you could use flax seeds. The recipe is super flexible and include or omit ingredients as you like. 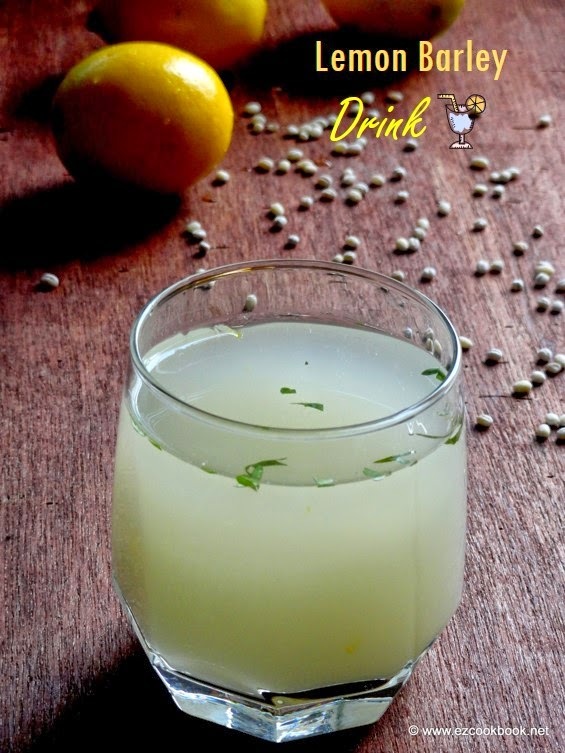 Lemon Barley Drink, this is what exactly we are in need in the upcoming months to beat the summer heat. Barley, I never tasted before until I step in Singapore. But I still remember in my native place it is given for pregnant ladies to overcome the swelling issues. After migrating to SG I keep drinking barley water atleast thrice a week to keep the body hydrate and cool to overcome with the humid weather. 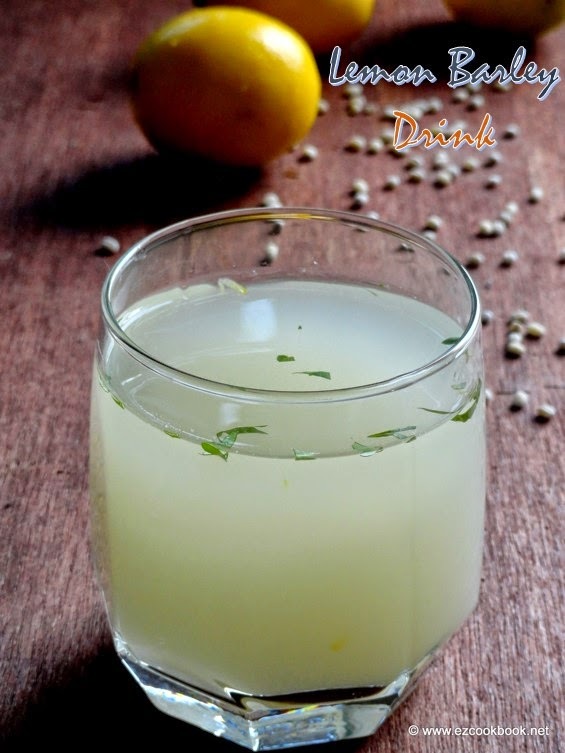 It is a perfect summer drink as it brings down the heat content from the body. Thats why it is generally given to people with high temperatures. Making your own barley drink at home is much affordable and brings out the better taste than the store bought drink which has high sugar content. Health Claims for barley drink may vary depending on the need - to clear sore throat problem, to promote lactation, as a pap for infant, to clear digestive systems, helps to weight loss, remedy for kidney stones and bladder issues. But for me it is still a quick refreshing summer drink. Wash the barley thorughly in cold water. Place the barley in a sauce pan and pour the water over. Turn on the flame to high and bring to boil. Simmer cook on medium high flame until barley cooks soft. This may take around 20 - 30 minutes. Add the zest of one lemon in the middle of cooking process. When it is done, skim off any foam on top, drain the barley water in a bowl using metallic strainer or muslin cloth. (keep the barley for whatever dish you want - use for salad, soup, stew or along with rice recipe). Next add juice of three lemons which is diluted with 1/4 cup of water and needed sugar. I have used minimal amount of sugar, increase as you desire. Stir well to dissolve the sugar completely. Chill the barley water in the fridge. Garnish with mint leaves(optional) and serve chilled with ice cubes. You can alter the water depending upon your taste , add more or less. Other citrus-based fruits can be substituted for lemon, if desired. Adding mint will enhance the taste of the drink, it's optional again. If you prefer add salt for sugar, add salt and include buttermilk for more taste. This stays good for 3-4 days in fridge. Important: You may pass urination frequently after having barley drink, which means it works to reduce body heat. This south Indian curry has an unusual combination of vegetables, which makes a flavourful side dish with rice or roti. One of the traditional recipe that is often made at my home when the seasonal arrivals in the market. The combination of drumstick, brinjal and mango brings out exotic taste even if you make sambar with it. There is no need to add tomatoes or tamarind to give sourness, just mango will do the magic. Wash the drumstick and cut into 2 inch sticks. Bring water to boil in a sauce pan, add the drumsticks and sprinkle generous pinch of salt. Let it cook till turns pale green and tender to break when poked with spoon. Drain the drumsticks and keep aside. Use the drumstick water to make rasam. Next wash the brinjals, trim the edges and cut into chunks. Heat a fry pan with a tbsp of oil, saute the cubed brinjals until turns soft. Now cube the raw mango as needed or of same size like brinjals. In another kadai or fry pan, heat a tbsp of oil, season with mustard, cumin, curry leaves in order and let it splutter. Add asafoetida, onion , garlic and saute till translucent. Now throw in the mango cubes, turmeric powder, a pinch of salt and cover with a lid. Simmer cook for 5 minutes. Uncover the lid - add the sambar powder, sauteed brinjals, drumsticks and jaggery. Check for salt and add as needed. Saute well to combine. Cook for another 5-8 minutes to incorporate all the flavours set in the veggies. Remove from the flame and serve with rice or roti. You can either de-skin the mango or add as such. It's upto your choose and preference. Since all these vegetables may vary with cooking time, it is must to fry or cook seperately to avoid mushy. If you don't have sambar powder, use a 1 tsp of chilli powder + 2 tsp of coriander powder. With the same combination of vegetables try to make sambar that taste equally delicious with rice. Brownies are a quick to make dessert that are "fudgy" and moist. These are rich and dense with chocolate. I just love to serve this dessert with scoop of vanilla ice cream. I know it's a ultimate delight for u too. Usually brownies are prepared using chocolate of any form whether it can be of choco powder or chocolates, but this decadent brownies are made out of unique flavours. 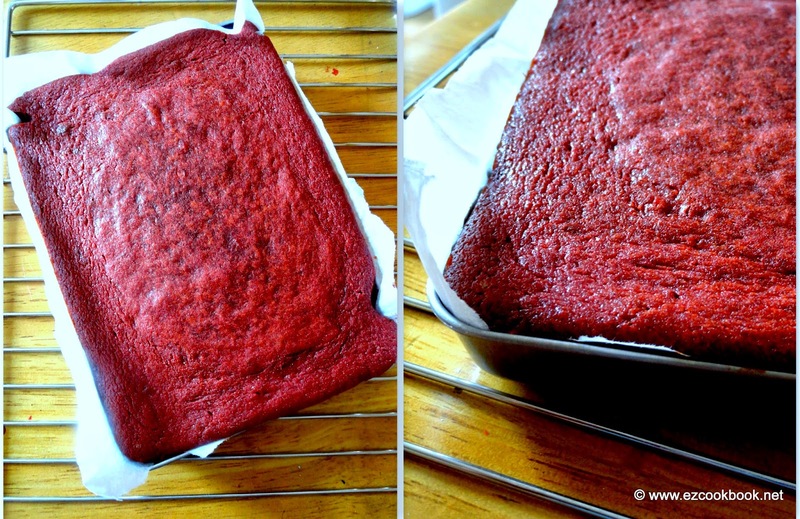 How about using beetroot and milo in brownie? It may be strange combination but believe me it works great. These brownies are egg-free. The tiny squares of these brownies are really treat to tastebuds. Brownies can be done very quick in one bowl. combine all ingredients and mix it up. Bake it for 25- 30 minutes. Cool and serve. Wash the beetroots and peel the outer skin. Cut into big cubes and steam cook or boil in a open pan. Cook the beetroots till it becomes mashable. Cool and puree it in the processor. Sift the flour, baking powder and add vanilla essence, choco syrup, sugar, milo. Spoon in the beetroot puree and softened butter. Now gently fold these into to make a smooth batter with milk. Place a baking sheet to the tin and pour the batter. Bake it for 25 - 30 minutes until raisen all over. Don't over cook. Cool completely in the tin , sprinkle with powdered sugar and cut into squares. Sorry I forgot to capture the sliced brownies in tray since i'm so excited to taste. When warm the brownies are still seems to be gooey or soft. But once cool, they will firm up and brownies tastes much better after several hours of baking. You can either soften the butter or melt it before adding to other ingredients. Cook the beetroots in the microwave power high for 10 minutes and puree it. This can be quicker process too. Don't over mix the ingredients as it might yield harder brownie. Adding the choco chips makes it more delicious, try it. If you prefer to use chocolate powder for milo, proceed with it, since I adapted the recipe from the original chocolate brownie.